Lately I have been participating to a course about the New Nordic Diet. I have been trying new recipes based on this diet. The main requirement of the New Nordic Diet is to eat a lot of grain, wild berries, vegetables and fish. You have to favor locally grown products. Based on this I decided to replace my white flour by wholewheat flour in most of my dishes. The recipe below fits perfectly in this diet. Preheat your oven for 15 minutes at 180°C. In a bowl, combine flour, baking powder, cinnamon and nutmeg. Make the butter melt in a pan. In a small bowl, beat egg lightly and stir in milk and maple syrup. Add the milk mixture to the dry mixture, then add the melted butter. Mix until the dry ingredients are moistened. Then stir in the apple pieces. Pour the mixture in the muffins tin. Bake for 20 minutes or until they are brown. Let the muffins cool down before turning them out of the tin. 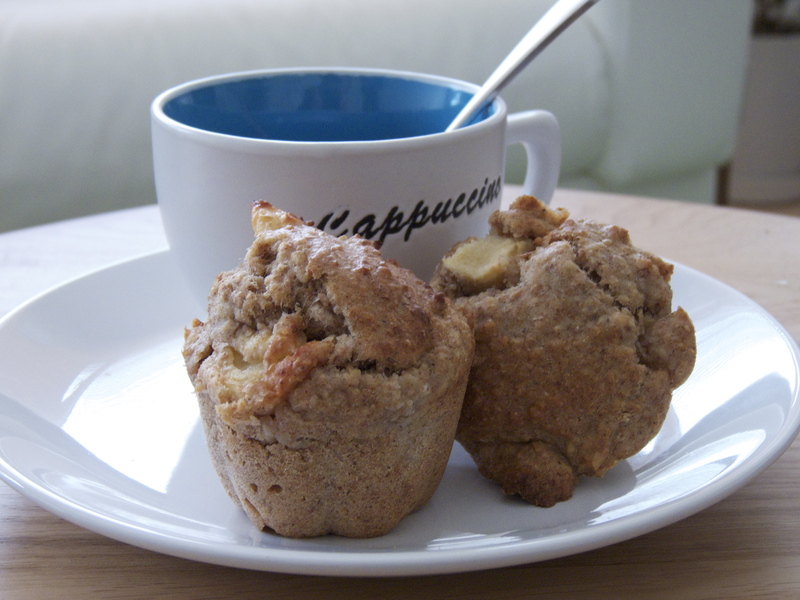 These muffins are perfect for breakfast or for a snack.